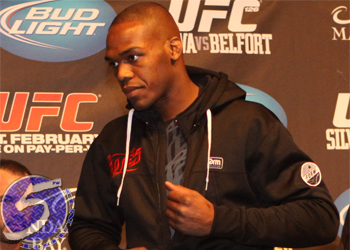 Back in late 2012, reigning UFC light heavyweight king Jon Jones (pictured) suggested a move to the heavyweight division could happen within the next year. Fast forward several month, an influx of new 205-pound contenders and Cain Velasquez cementing his spot atop the heavyweight throne has Jones singing a different tune. “I have no interest at this point,” Jones said during Monday’s UFC 172 conference call of jumping to heavyweight to challenge Velasquez. “There’s a lot of great competition for me to test myself against [at light heavyweight]. At just 26 years of age, Jones became the UFC’s most decorated light heavyweight champion by notching his six straight title defense in beating Gustafsson in September. However, Gustafsson did something to Jones that no other man had ever done inside the octagon – made “Bones” look beatable. In fact, many pundits believed Gustafsson should have been on the other side of the unanimous decision verdict that was awarded to Jones. If Jones gets past Teixeira this Saturday, a sequel with Gustafsson is next. Davis and Jones went at it during today’s media call, so he could very well be in the mix with a win over Anthony Johnson this weekend. Speaking of Johnson, “Rumble” returns to the UFC in a weight class that he should have been competing at all along and could also pose a threat to Jones’ reign. And of course, Daniel Cormier is quickly closing in on his archenemy. Just when it appeared as though Jones had waxed his division completely clean, a handful of fresh blood has him rethinking relocation. Teixeira gets next crack.